We had a nice leisurely start the next morning and over a casual breakfast made our plans for the day. First, a drive around Red Cliffs to find the river, with a stop at Barclay Square (no, not the one in London) in the town centre to see Big Lizzie. She’s a huge traction engine, the largest of her kind in the world and she was used to clear 13,355 hectares (33,000 acres) after World War 1 as a settlement for returning soldiers. In fact, Red Cliffs is the centre of the largest irrigated Soldier Settlement since 1918. 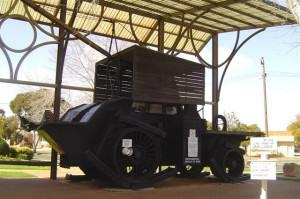 The Red Cliffs and District Historical Society is responsible for the restoration of this marvellous piece of machinery and the shelter was erected in 1988 by the Mildura Shire Council. We lost the Murray River! We spent a little time that morning driving around Red Cliffs but we still didn’t find the river. It’s the Murray, for heaven’s sake, but do you think we could find it! 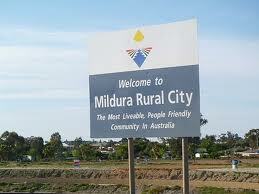 So, it was off to Mildura for a little bit of sightseeing and retail therapy. 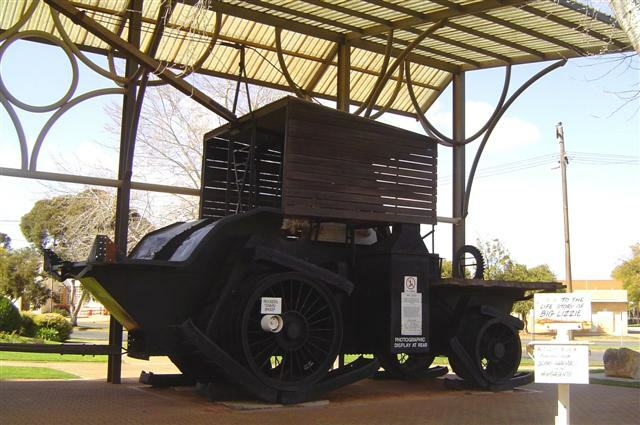 Established in 1887, the town is located in what is known as the Sunraysia region and the name is an Aboriginal word that translates to ‘red earth’. Often referred to as the Mediterranean in the outback, the town has a cosmopolitan flavour. The area is renowned for its fruit growing and grape production. 80% of Victoria’s grapes come from this region including 34% of Australia’s wine grapes. Angus Park, in the suburb of Irymple, is famous for its dried fruit and dried fruit products. We paid a visit to their factory store and left some time later with our wallets considerably lighter. We found the Murray River! 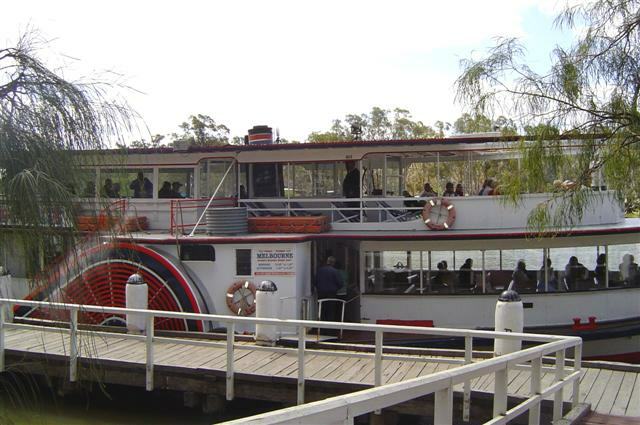 Our next stop was at the wharf to check sailing times for the paddlesteamer; our afternoon would be spent on the magnificent Murray (yes, we finally found the river). At 2520 kilometres (1566 miles) the Murray is the third longest navigable river in the world, after the Amazon and the Nile, and spans three Australian states, New South Wales, Victoria, and South Australia. I was looking forward to seeing just a small part of it this day. John, of course, wanted to fish it! That’s a lot of wine! We left the wharf and crossed over the bridge (border) into New South Wales and headed up the Silver City Highway to visit the Stanley Winery. The gate at the winery was guarded by a giant Stanley wine cask and as we drove in our jaws dropped at the sight of several acres of huge tanks reaching high into the sky. And, yes, those tanks or vats were all filled with wine! Entering the cellar door we were presented with an elegant room that held several displays of the various wine labels and merchandise that is available here. A cocktail bar stretches the length of the room and we settled in for some serious wine tasting. Well, at least I did; John was driving so had to keep his tasting to a minimum. We were offered tastes of 3 or 4 different wines before a tour bus arrived. 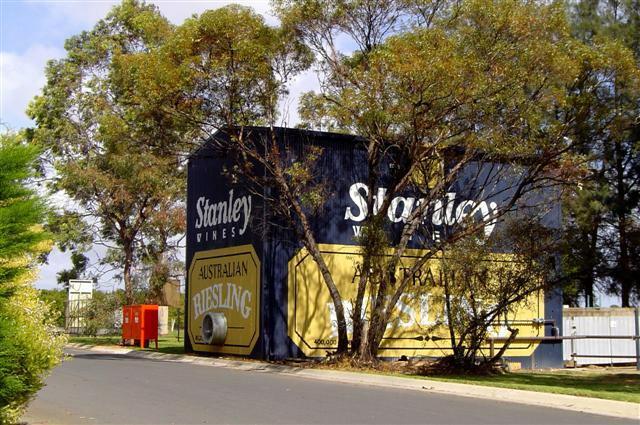 With about forty people crowding into the room it was time for us to beat a hasty retreat and with our purchases tucked firmly under our arms we bid farewell to Stanley Wines. After lunch we returned to the wharf for our cruise on the paddlesteamer MV Melbourne. The Melbourne was originally launched in 1912 and after years of working up and down the river she was abandoned to wallow in neglect. Privately purchased and fully restored in1965 she set sail on her maiden voyage with passengers on January 1st, 1966. She’s almost 30 metres (98 feet) long and 6½ metres (21 feet) wide at the waterline and approximately 12 metres (39 feet) across the top of the paddles, with a flat bottom and very shallow draught; the bow draws ¾ metre (2½ feet) of water and the stern 1 metre (3 feet) so she could float and operate fully in only 1¼ metres (4 feet) of water. Her maximum speed is 18 kilometres (11 miles) per hour. The wind was blowing hard and it was very cold as we moved away from the dock and into the channel heading towards the lock. 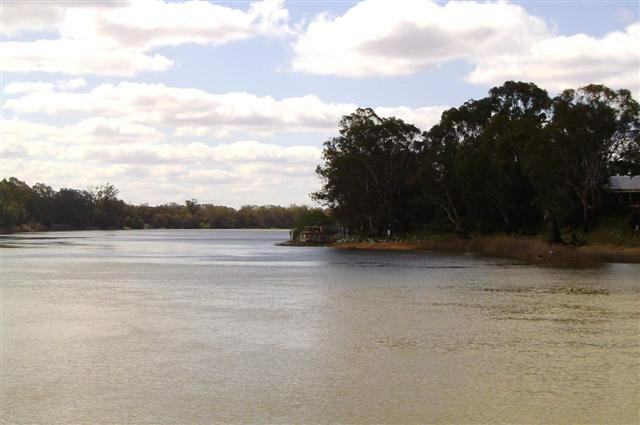 The Murray River has a system of locks because of the varying levels of the water. The locks were built to control the river flows; during normal flow there is an almost 4 metre (13 feet) drop between river levels. The lock is an amazing thing. Our Captain manoeuvred us in and we stopped. The huge metal gates behind us slowly swung shut and then the water was pumped out. As the water level went down, so did the Melbourne. Finally when almost all the water was gone the gates in front of us opened and we moved out, back onto the Murray but several metres lower than we’d been before. 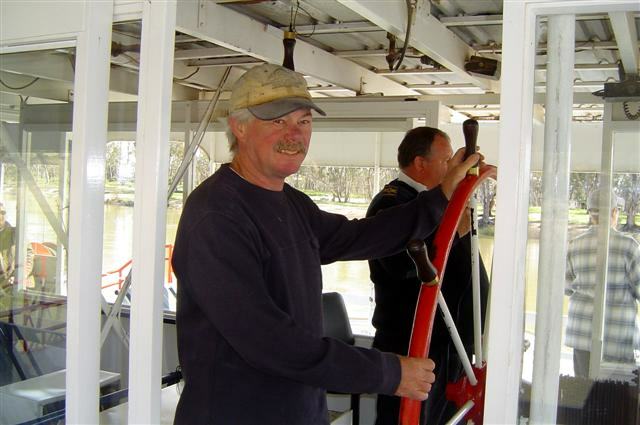 We cruised past Lock Island, which was formed when the channel was dug in 1927 and now holds a memorial, before cruising up the Murray River. 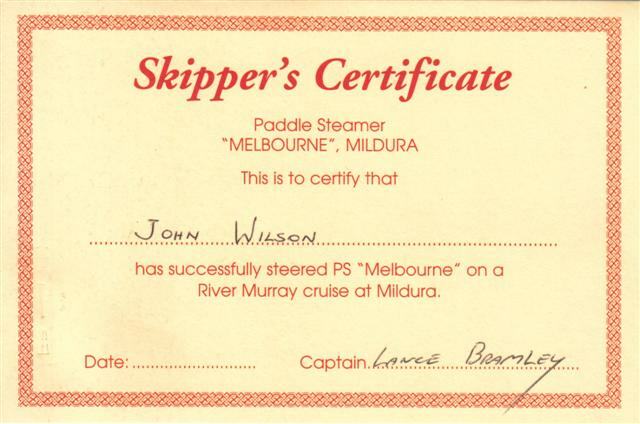 We cruised past the Old Mildura Homestead, which was the site of the original ‘Mildura’ pastoral lease, and Apex Park where Australia’s only inland Lifesaving Club patrols the beach in the summer. 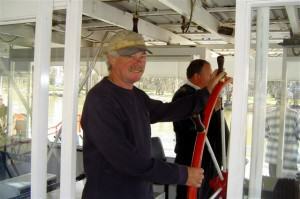 John went into the wheelhouse and steered the boat along the river for a while. 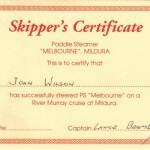 For this he received a skipper’s certificate from the Captain. We cruised past the Buronga Riverside Caravan Park and John thought that looked like a great place to do some fishing and a picnic sounded like a fun idea. Returning to the dock some two hours later, the afternoon had become a lot colder but before returning to camp we drove out to the Buronga Park and John found the perfect place for some fishing and a picnic tomorrow. A cold wind had come up and it was time to call it a day. On the way back to camp we did a little touring around Red Cliffs. John insisted that the river must pass through this town somewhere. Well, we finally found it but unfortunately discovered that there’s no access to it in Red Cliffs, either in the car or on foot. It turned out to be a cold and windy night and our plans for fishing and a picnic were thrown into the rubbish bin when we awoke to heavy overcast, bitterly cold wind, and rain. It looked like being a quiet day at camp but by about 11:30 we were suffering from cabin fever and so went off for a drive to see the Lindeman’s Winery. Well, we never reached the winery because John discovered an unsignposted road that wasn’t even on the map. You just know what’s coming next, don’t you? He can’t help himself; he just had to explore it. Unsealed and narrow it was more of a track than a road and it led straight to the river. Moored along the river’s edge were houseboats, a lot of them, and obviously people were living aboard them. I think it would be great to live on a houseboat! A little further on people were camping and the sign said “Sandbar Camping Ground”. It was bush camping in the extreme, absolutely no amenities. Most of the people appeared to be huddled in their tents or campers and it seemed to me a most sensible thing with the weather being so unfriendly. John must have agreed because my suggestion that we return to our camp didn’t even get an argument. Not long after that a weather front moved through with strong, icy winds and heavy rain and this set the pattern for the rest of the day. It was a miserable end to our stay in Mildura but having said that, we’re certainly not deterred from returning some day. 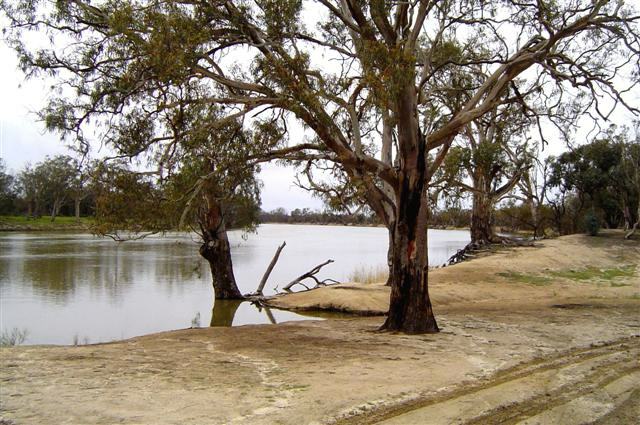 There is much more to see in this lovely rural city and nearby are the World Heritage Listed Willandra Lakes and the Mungo National Park, two great reasons, if we needed one at all, to make the return trek to this Mediterranean in the outback.